There are many interesting things to say about The Trip, Michael Winterbottom's luminous and positively-reviewed film starring the British comedians Steve Coogan and Rob Brydon. 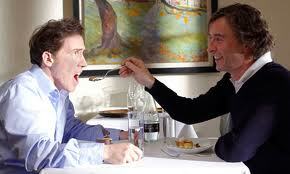 Commentators have praised the movie for such qualities as the blurred line between reality and fiction (Brydon and Coogan play characters who are a lot like themselves) and the actors' frequent and hilarious lapses into doing impressions of celebrities. What interests me about The Trip primarily though is the way in which the film appears to be extremely quirky and unconventional -- e.g. in addition to those aspects mentioned above, it centers on an inconsequential little scenario which sees Brydon and Coogan meandering around the north of England in Coogan's Range Rover, sampling tasting menus at a bunch of very fancy restaurants -- and yet at heart, The Trip conveys a very traditional message: At the end of the day, love and family ties are more important than fame and money. As such, the film epitomizes the concept of 'old wine in new bottles.' So for the many artists and thinkers who believe that there are no new ideas but only new ways of packaging old ideas, the film makes for critical viewing.